We’ll help you take the guesswork out of planning your wedding, so you can relax. With our unique approach, you can confidently book and plan the destination wedding of your dreams without spending a small fortune in the process. Our specialized method takes the stress and hassle out of planning and does the heavy lifting for you. We help you plan a successful, elegant event that doesn’t have that “vegas feel” and is so much nicer than going to the courthouse. 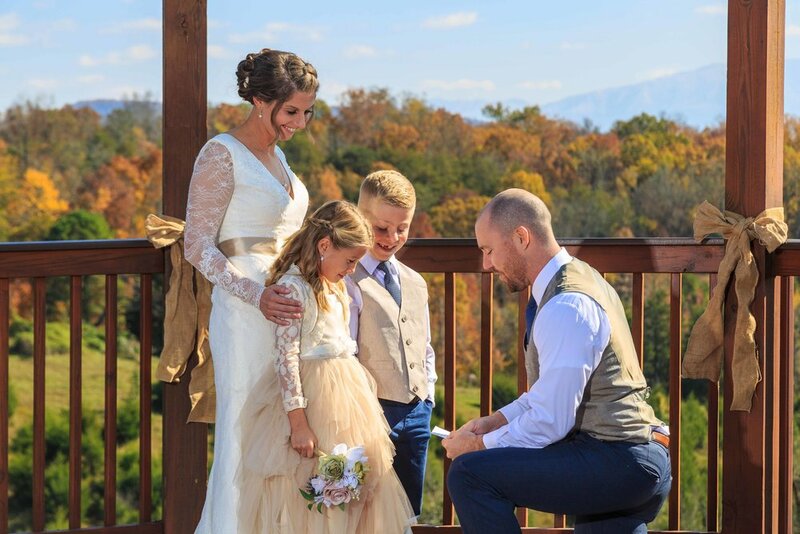 We are organized and know all of the steps it takes to host a successful wedding ceremony in the Smoky Mountains. **Digital Image Ownership Not Included in Weekday Elopement Special But is Available As a Package Add-On. Ask a Coordinator for More Details. Elope in Tennessee! Say I do to the classy country elegance of Flower Mountain! Your photos will look stunning with our rustic & natural settings. If you’re looking for the perfect mountain-top ceremony, without all the fuss and frills, have your intimate event with us! Get married at Flower Mountain and enjoy a honeymoon stay in the Smoky Mountains. No need to look anywhere else! This is the all-inclusive elopement package you’ve been looking for! Lodging is provided for bride + groom only. Life is full of storms and uncertainty. We believe that God’s plan for marriage provides the firm foundation for any successful relationship. That’s why we believe that God should be included in the celebration of your marriage. Many area officiants are removing the mention of God and His blessing from their wedding ceremonies to provide a more secular approach to marriage and to appeal to couples of alternate lifestyles. Our approach is not to push God upon anyone, but to introduce a common understanding that covenant marriage was first established by God and can only be held together successfully through Him. Our mission is to treat each one of our clients how we would like to be treated and to honor God, whom we believe instituted marriage. We are passionate about supporting your marriage with prayer, SYMBIS (Saving Your Marriage Before it Starts), marriage coaching and spiritual guidance as resources that are available to you. You shouldn’t have to compromise your values and beliefs to have a beautiful, destination wedding in the Smokies. Many couples express their concerns about who will be performing their ceremony and what words will be said. The core concern is to have an officiant’s blessing on their marriage that is in alignment with basic Christian beliefs, who also does not perform unions for alternate lifestyles and commitment ceremonies. We will work closely with you to ensure that you have a personalized Christian ceremony that celebrates your love and commitment to each other. Wait! What if it rains? (and still enjoy the scenic outdoors) or indoors by a beautiful hearth and fireplace. OK, we’re sold. How do we reach you guys? Contact a wedding coordinator today with any questions or to book your wedding! If you have any questions, check out our FAQ page first!